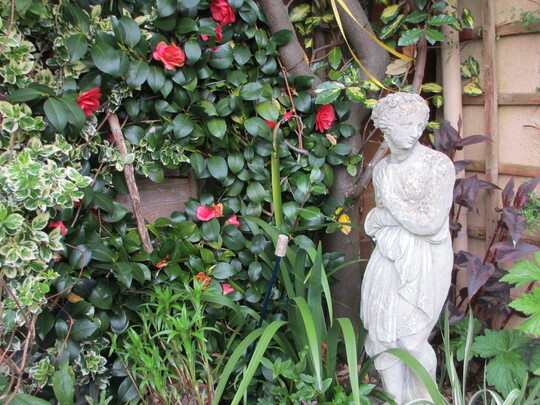 Siris in front of Shrubs Camellia, Elaeagnus, Euonymus and Persicaria Red Dragon. Iris foetidissima Citrina, variegatum and Lilies at the front. She looks lovely there the camekia is lovely such a lovy variety there. Stera, don't worry about her getting cold, this corner gets the late eavening sun. Just put the seating bench out there now. This photo is of species Camellia.